A shared notebook in Evernote is a notebook that you’re sharing with others and that you can always update because it’s yours. 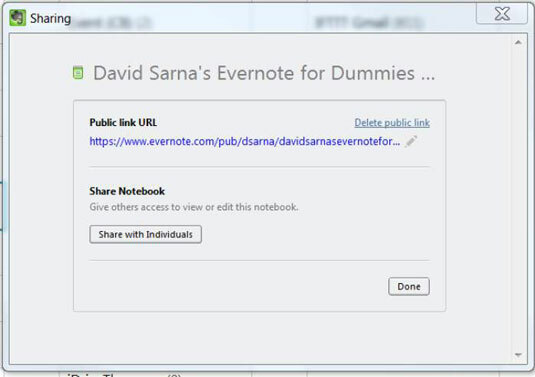 A linked notebook is one created by another user that you can link to your Evernote account. If the user who created the notebook is a Premium member, you can — if given rights to do so by the notebook owner — update information in the linked notebook. Otherwise, you have read-only access to the linked notebook. You will get a dialog box where you can select whether you want to share the notebook with individuals or share it with everyone by creating a public link. Select the Create a Public Link URL option. You are given a dialog box with a URL that you can share with others by copying and pasting it into e-mails, chat windows, or anywhere else you want to share the notebook. Copy the URL by selecting it with your mouse and pressing Ctrl + C on your keyboard for PCs and Command + C for Macs. Once you have copied the link URL to your clipboard, you can go ahead and share it wherever you want such as in a chat message or on Twitter. Click Dismiss to complete the notebook-sharing process and be taken back to your Evernote account page, or, if you have changed your mind about creating a Public URL link, click the Delete Public Link. You will then be taken back to the original Share this Notebook dialog box in case you want to start the share process over again and choose the other option. Click the Dismiss button to close this box.